Apostolic Titbits: You Say, God says. Choose What He Says To Be Blessed! 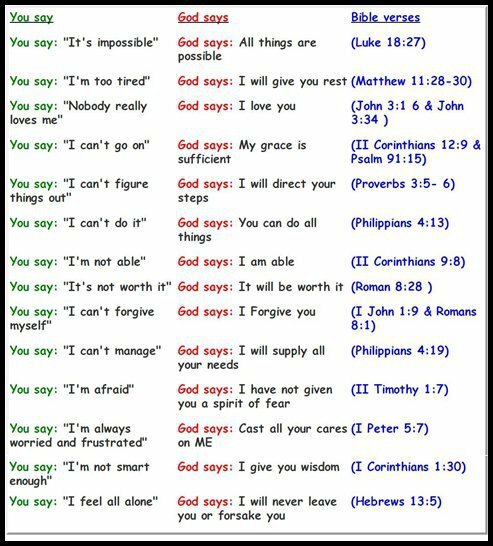 You Say, God says. Choose What He Says To Be Blessed! Stop What You Are Saying, and Dare To Believe and Say What God is Saying! "6 But the righteousness of faith speaks in this way, “Do not say in your heart, ‘Who will ascend into heaven?’” (that is, to bring Christ down from above) 7 or, “‘Who will descend into the abyss?’” (that is, to bring Christ up from the dead). 8 But what does it say? “The word is near you, in your mouth and in your heart” (that is, the word of faith which we preach): 9 that if you confess with your mouth the Lord Jesus and believe in your heart that God has raised Him from the dead, you will be saved. 10 For with the heart one believes unto righteousness, and with the mouth confession is made unto salvation. 11 For the Scripture says, “Whoever believes on Him will not be put to shame.”" (Rom 10:6-11). As the word of God says, if we choose to confess with our mouth what God has already revealed in our heart as His will for our lives, only then deliverance, salvation, victory over sin, healing, prosperity and wholeness can be obtained by us. We cannot become a blessing until we ourselves are blessed mightily. So choose to say what God says and be blessed to be a mighty blessing to many.